Yesterday I was out in the paddock with the horses and dogs when I heard laughter coming from the chicken coop. 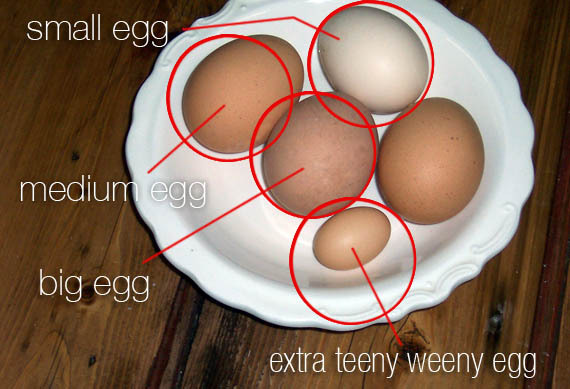 “Chook chook chook… here you go…. No ducks! You’re a duck! Get out!” etc. But then I heard laughter. Real belly laughter. At first glance its just another egg, right? 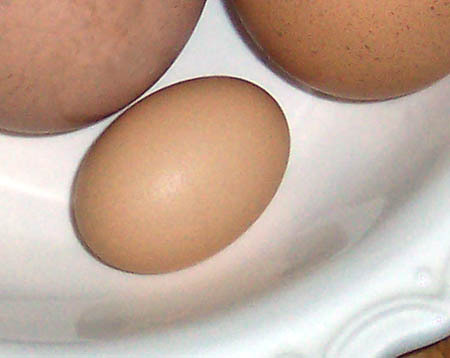 Its the smallest chicken egg in the world! The poor chicken that lays the huge eggs, straining and pushing, face all squinched up, leaving claw marks on the perch as she struggles to bring forth the monstrous eggs. I love all things miniature. I used to have a big miniature collection of anything tiny. 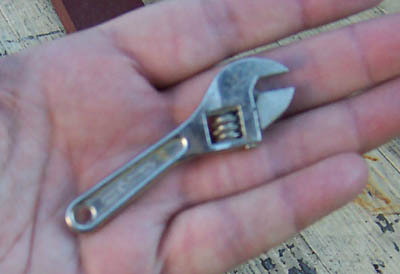 There’s the (working) tiny spanner I have on the ute (truck to my american friends) key ring which Wayne gave me. I sold most of my miniatures a few years ago, all except the poodles, but this is one I want to keep. Now… how best to preserve it… Boil it so its hard? Or punch holes and blow it empty which will mean no stinkiness if it breaks, but its much more fragile…? I was putting the eggs into the fridge and dropped it!!!!!!!!!!!!! This entry was posted in animals, life on the farm, ponderings by zefiart. Bookmark the permalink. Wah! I was going to tell you to just put it somewhere safe and leave it. The insides will eventually just dry up. I did that with my Pysanky eggs ages ago. Now you need to find the right chicken and ask her to make you another baby egg. *S* Sorry about the teeny egg! We used to go to the Italian Market in Philadelphia, PA (famous now, just an open-air market in the city, then). The big poultry place had racks and racks of odd eggs. 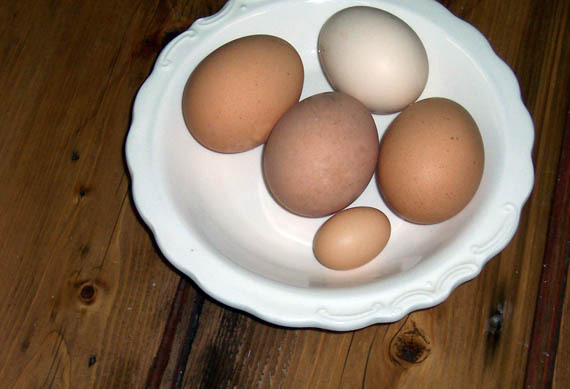 The first one a chicken lays is usually tiny and often oddly shaped. No, never brought any home. My ex gave me a Pysanky Egg one Easter. They're gorgeous! Now I can't find it. The Ghost of Paddock Way seems to have gone off with it!